Another popular bag choice for carrying first aid equipment or storing gear on the apparatus. 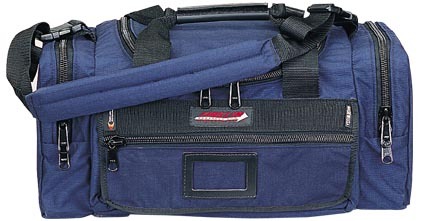 Features one padded center compartment, two end compartments and two handy front zippered pockets for additional space. Other features include a leather handle, I.D. holder, and removable shoulder strap. Constructed of Cordura® Plus nylon, heavy-duty buckles, webbing, foam padding and YKK® zippers.